King Bruce has done it again. In the midst of an Iron Maiden renaissance he released what is easily one of the best heavy metal records of the new decade. Tyranny Of Souls is a musical amalgam of the excellent Accident At Birth and The Chemical Wedding. Fast paced songs on the verge of thrash metal and more ‘Maiden worthy traditional songs haunt the new album. Produced by outstanding guitarist Roy Z, whose chops are on par with Adrian Smith, Janick Gers and Dave Murray, this record shines from pillar to post. Roy Z produced Dickinson’s 1994 solo record, Balls To Picasso and also produced the most recent Judas Priest record. Bruce’s voice has never sounded better and he hits those killer screams with much ferocity. The classic song here, maybe one of the best Harley motorcycle songs of all time, is Devil On A Hog. An unbridled tribute to rebellion, this song is utterly virulent. You will want to crank it up and play the song at least eight times in a row; I guarantee it. Other tracks of noteworthy mention are Abduction – a song about aliens and genetic manipulation, Navigate The Seas Of The Sun, River Of No Returnand Soul Intruders as well as the title track. In fact there is very little filler here. Bruce has been subtly exploring the themes of space exploration and mythology for years and Tyranny Of Souls is no exception. 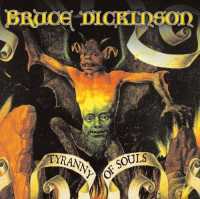 Tyranny Of Souls makes a wonderful completion to a trilogy of excellent records for Bruce over the course of eight years. In context they are as good as anything Iron Maiden has done, especially recently. In fact they would have made excellent ‘Maiden records. Don’t get me wrong I love Iron Maiden but Bruce’s last few solo records have been simply stellar.